Awhile back, approved someone from Ile de France cheese contacted me and asked if I would be interested in some free cheese to feature on the blog. Free cheese? Camembert? Yes please. 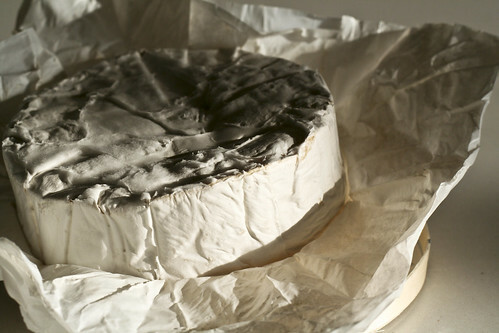 So, what is Camembert exactly? It’s like a stronger-tasting brie. Creamy and tangy, a bit nutty and very delicious. Now, to come up with a good recipe to showcase the cheese. I feel like a contestant on Top Chef. Ever since black mission figs started appearing at the stores, I’ve been roasting them with olive oil, sugar and lots of black pepper. They emerge from the oven caramelized and just a bit spicy. Absolute heaven and perfect for a cheese plate. 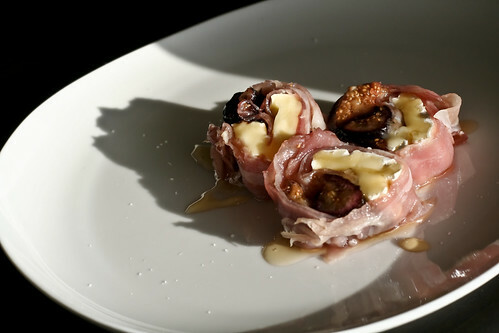 A cheese plate is a bit indulgent for just me and my husband, so I made “sushi” rolls with the roasted figs, the Camembert and prosciutto. Drizzled with honey and sprinkled with truffle salt, these are an indulgent and delicious snack, hors d’oeuvre or appetizer. You can also stack all of the ingredients into a crusty baguette for a most delicious sandwich. Roast the figs by preheating the oven to 400°. Line a cookie sheet with parchment paper and de-stem the figs, then halve them and place them on the prepared cookie sheet. Drizzle with the olive oil, sprinkle with the sugar and black pepper. Bake for 30 minutes, or until the figs caramelize and are soft the whole way through. Remove from oven and let cool. On a piece of parchment paper, begin laying out the prosciutto slices next to each other length-wise. Each piece should overlap by about 1/3. Place the Camembert in a row evenly down the center. Place the roasted figs right next to the Camembert. Using both hands, carefully roll the prosciutto the way you would a sushi roll. It should look like a little prosciutto log when you’re done. Using your sharpest knife, slice it into rounds and place on your serving plate. Let the cheese come to room temperature (it’s tastiest this way), then drizzle with honey and sprinkle with just a pinch of truffle salt. Sounds fantastic, I just came across a recipe for a savory fig jam. You have inspired me to give it a try! I like the unique spin you put on your dishes. Thanks Erinn! I love savory fig jam. Does your recipe call for toasted sesame seeds? I made one with those last year and it was fabulous! This is really interesting. I like how you posed them as sushi rolls. And, I’m sure it’s quite exciting to receive cheese in the mail. These were EXCELLENT, and got rave reviews from my family. I can condition a respectable use of practically any process which might be abused. I can direct to authentic utilizes of websites which may exist to be on conflict with Yahooâ€™s webmaster guidelines.